SILVER SPRING, Md. 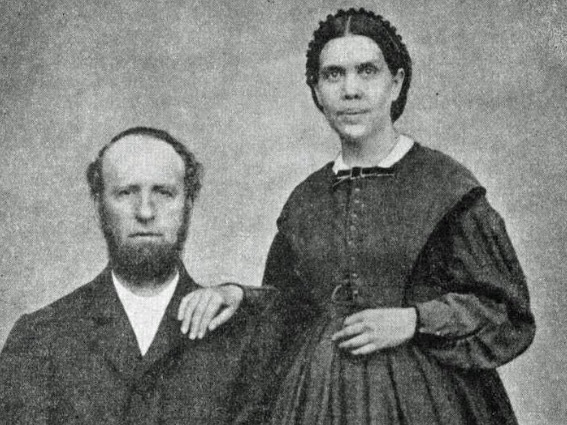 --- In a push to present a "unified Adventist look" to the outside world, Adventist leaders have ordered members to dress exactly like James and Ellen White. Men have been asked to grow "truly magnificent James White-style beards" and both genders have been asked to shed modern dress for "Adventist pioneer garb that truly speaks to our unique identity as Seventh-day Adventists." A statement announcing the new denominational dress code claimed that Adventists no longer look "peculiar enough" in their mall-purchased clothing. To help facilitate compliance with the new dress code, ABC stores around the world will stock period-appropriate Victorian day dresses, EGW-approved red dresses, top hats, bonnets and frock coats. Fake beards will be available for facial hair-challenged men. I’m not understanding the ‘EGW approved red dress.’ What’s that? Ellen once wrote that every woman should have a red dress. This should provide a welcome, new revenue stream from the steampunk crowd, who will be delighted at having a new source of Victorian costumes. Have you ever worn heavy woolen clothing in the hazy, hot & humid weather? Will somebody get real here, please? But this happened in real life! !